* Do not use essential oils on and around cats under 10 weeks old, and avoid using oils on and around puppies. * Animals are generally more sensitive to essential oils than humans are. It’s best to heavily dilute essential oils and use them in moderation. * Every animal is different, so carefully observe how your animal responds to essential oils. Use common sense and good judgment as you try different methods. * Be especially careful to not get essential oils in an animal’s eyes. * If diffusing, always allow cats to leave the room as well as access to areas where they can avoid the diffused oil. * With all animals, avoid using high-phenol oils ~ such as Oregano, Wintergreen, Clove, Mountain Savory, and Thyme. This is especially important with cats. * Use special caution with cats and essential oils. Avoid applying citrus oils topically, diffusing the scent around cats, and having your cat ingest them. Every animal is different so use your best judgment and basic common sense when it comes to your own pets. For example, my cats love to be near the diffusers throughout the house but will leave the room if I am diffusing an oil they don’t care for. Mostly, they love the oils and will lick them off my hand when I use them topically. I have experienced no adverse effects with any of our animals over the many, many years I have been using Young Living. And, even my Animal Reiki clients respond well to the oils! Animals are incredibly intuitive regarding their own needs, therefore, I allow the animals to “talk” to me when working with them. * Wear essential oils throughout the day so your pets will be exposed to the aroma as you hold them, play, or snuggle on the sofa. *Diffuse essential oils in spaces where your pets like to relax. 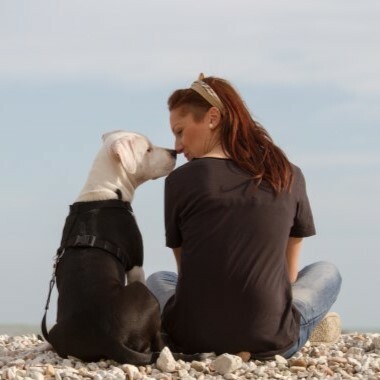 Keep in mind that dogs tend to stay in a room with their human even if something is bothering them. Closely watch for signs of irritation ~ such as whining, sniffing, nervousness, and excessive scratching ~ while diffusing around them. * Apply an essential oil to your hands and let your pets smell them so they can explore the scent on their own terms. * If your pets are jittery or resistant to essential oils, try applying an oil to yourself and staying near the pets for several minutes so they can get used to the aroma. * Use extra caution around birds, fish, and pocket pets! * For cats, small dogs, and other smaller animals, use a carrier oil ~ such as V-6™ Vegetable Oil Complex ~ to dilute the essential oil before application. We suggest at least a 4:1 ratio of carrier oil to essential oil. * If you’re using essential oils on medium-sized animals ~ like large dogs ~ dilute 3:1 carrier oil to essential oil. * For very large animals ~ including horses and cattle ~ start with a 1:1 dilution and, if desired, move to the directions indicated on the bottle. * We recommend applying to the paws for dogs, using the “petting” method for cats, and to the spine and flanks for animals with hooves. * For easy and comfortable application, rub oils (and carrier oil) between your own hands and then apply by stroking the animal. * For easier application in large or hard-to-reach areas, combine essential oils with V-6 or with water in a spray bottle. Spray into your hands and then apply to animals rather than spraying directly on the animal . . . especially smaller animals who may not like the spray bottle. 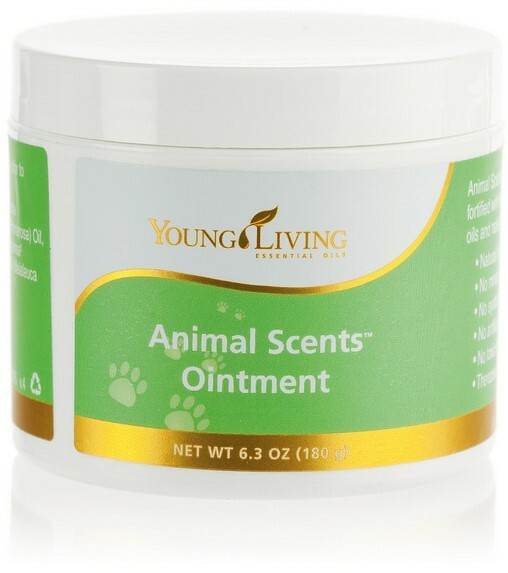 * Use Animal Scents® Ointment to seal and protect any areas where essential oils have been applied. * We recommend consulting with a trained veterinarian who has experience with essential oils prior to administering oils internally to your pets. You should not attempt to mix oils with food unless directed by a veterinarian. If you choose to mix essential oils with your pets’ food, keep in mind that the smell may make the food undesirable to the pets; this is especially true for cats. * If you apply oils to your pets’ paws, they will likely lick and consume some of this essential oil as they groom and play. Make sure you dilute heavily so the amount your pet ingests or absorbs is minimal. * Never force your pets to consume essential oils or food mixed with essential oils. Young Living also offers a full line of animal-specific products, including essential oil blends made just for animals, cat treats, dental pet chews, and Animal Scents® Shampoo. Log on to our website and search ‘Animal Scents Pet Care’ to find something your pets will love! Looking for even more ways to show your furry friends some love? Check out our Healing Oils For AnimalsFacebook page!